Prototype: Duisburg Inner Harbor crane as it looked at the start of Era IV. 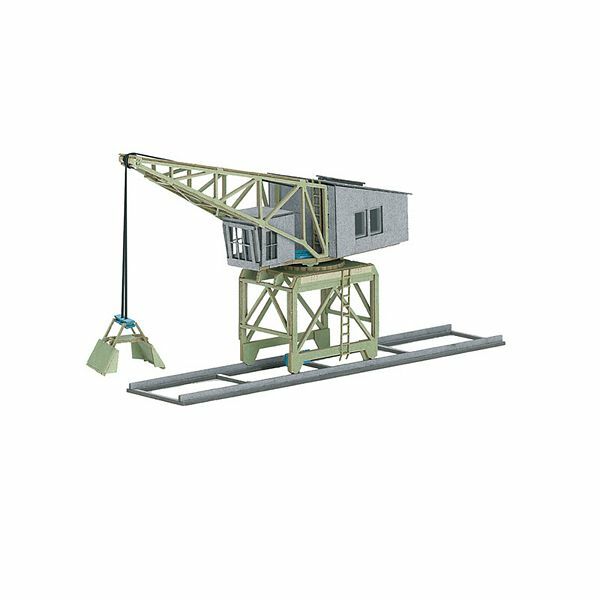 Used to load and unload bulk freight such as coal and ore.
Model: This advanced building kit is precision laser-cut from high-quality architectural quality cardstock and is a model of the Duisburg Inner Harbor crane. The parts are laser-cut precisely from special quality architectural quality cardstock. All of the parts already in a realistic basic paint scheme and they can be weathered and painted further with no problem. The crane cab can be turned carefully on the base. Dimensions about 60 (L) x 16 (W) x 45 (H) mm / 2-3/8" (L) x 5/8" (W) x 1-3/4" (H), Length of the under frame about 20 mm / 3/4"